American football is one of the most systemized sports in the entire world. It contains most of the best athletes and greatest genetic specimens alive today. Every detail about football is covered at a very high level all the way from strength training, conditioning, recovery from exercise, recovery from injury, scouting, strategy, gameplay communication, video footage, ideal weight/height/limb length for each position, academics, etc. You name it, football has a statistic and system for it. Because it is one of the most highly competitive sports on the planet today, from both a physical and business standpoint. Everybody wants in on it and if you’re an athlete on a high profile team, somebody out there is trying to take your job every day. Every single day. The scary reality that you may be replaceable. If your game, body composition or focus begins to slip, you better bet there’s another athlete out there fighting and training to take your spot. Because nutrition as a means to drastically improve performance is routinely overlooked by athletes and coaches. Nutrition has the power to enhance so many different systems in the body and not just from a health perspective, it can have massive contributions towards your performance where it matters, out on the playing field. In a sport such as football where everything is measured in inches and seconds, getting every advantage you possibly can is a must. For example, did you know that simply just dropping your body fat will immediately increase your speed? The drop in body fat is a means in which to increase your current relative strength, which means how strong you are at your current body weight. A 180lbs guy who can squat 400lbs has greater relative strength than the guy who is also 180lbs but can only squat 300lbs. Well, the two biggest factors when it comes to speed development are your stride length (distance you cover per stride) and stride frequency (amount of strides taken per unit of distance). When you drop body fat, you immediately increase your current relative strength and when you increase your relative strength you have a direct impact on your stride length potential. To make an example of this let’s go back to the two 180lbs football players who squat 400lbs and 300lbs. Let’s make the math simple (because force production can get a little messy) and make the easy claim that when you squat 400lbs you are exerting 200lbs per leg in order to get that squat up. Whereas the other guy who can only squat 300lbs is only exerting 150lbs of force per leg in order to get that squat up. Here’s the problem, they are both the same weight, so the guy who can squat 400lbs has more explosive force to propel his body forward. When he starts a sprint he is driving his leg backwards with 200lbs of force into the ground as opposed to 150lbs. This means he is propelling his body forward at a faster rate and increasing his overall stride potential and therefore his explosive speed. What’s important to recognize here is that we reached this point through nutrition. Nutrition will grant your body fat loss and nutrition will also grant you the maximum retention of your lean muscle mass while you are dropping this body fat. Many athletes don’t connect nutrition to speed but the connection is there and it is strong. A nutrition analogy I like to use with athletes is that they are very similar to a performance race car in a couple of different ways. First and foremost you don’t put regular gas in a high performance car, that thing needs premium fuel in order to hit maximum speed. Just like athletes, you guys need to be properly fueled in order to reach your performance potential. Additionally, when race day comes the driver doesn’t just haul the old Formula 1 out of the garage, blow the dust off of it and then hit the start line. They fine tune that machine year round from every angle they can so that come race day no stone is left unturned and they are as prepared as possible to perform at the highest achievable level. That’s the type of mindset I want you guys to have. 360 degree performance coverage, this is impossible to accomplish without understanding the energy system demands of the sport and how you should be fueling your body from a nutritional standpoint. If you’ve left yourself with no preparation, it’s a recipe for sub-optimal performance. A high performance machine will not perform on an empty tank (skipped meals) but it will also not perform with a tank full of crap. Sports performance nutrition isn’t just about “clean eating”. It’s a great start, but different sports burn different energy substrates (phosphocreatine, carbohydrates, fat). Clean eating, albeit nutrient dense, doesn’t necessarily represent the fuels you will primarily be using both out there on the field and during your strength and conditioning work. This means breaking down football from a physiological perspective is a must if we are going to do this thing right. For those of you unfamiliar with energy system demands of the body, I’ll spare you the long lecture and get straight to brass tacks. You have three energy systems within the body that are either trained and emphasized to gain sport performance, or limited due to their inapplicability towards performance. On one end you have your pure strength system which is known as the alactic energy system which primarily utilizes stored ATP and phosphocreatine for its energy use. This system is how the body creates a tremendous amount of force in a short time frame. Typical sports that fall under the alactic-dominant category would be powerlifters, Olympic lifters, throwing events, and sprinters. In the middle we have the lactic system which primarily utilizes carbohydrates as its main fuel source. This system is how the body maintains high levels of force output 1-2mins at a time sustainably before succumbing to fatigue. Typical sports that fall under the lactic-dominant category would be 400m runners, 800m runners and 400m swimmers. On the total opposite side of the alactic energy system we have the aerobic energy system which primarily utilizes both carbohydrates and fatty acids as a fuel source. This is the system we utilize throughout the day during all low intensity activity such as walking, jogging, climbing the stairs, etc. But a well-developed aerobic-dominant athlete will excel in sports such as marathon running, triathlons, and iron man. Well, it is these components that make nutrition (and training for that matter) for performance football so unique. In football, you guys need a little bit of everything. You need to be strong/powerful, you need endurance capacity under anaerobic conditions and you also need a well-developed aerobic system to ensure maximum recovery and energy replenishment between plays. This means there is no single nutrient or protein shake that is going to bring you up to the next level. A well-rounded, scientifically sound meal plan built with the intention of elevating your performance from all angles is a must and this requires a dive into your entire day’s nutrition. Not just before and after games. Lastly, it’s important to make a clear note on career longevity in the sport of football. The longevity of a football athlete operating at peak performance can be a pretty slim duration. Nutrition as a means to improve your health bio-markers, improve the rate and quality at which you recover from injuries, improve your sleep quality, and properly fuel your for performance sets up all the groundwork necessary for ensuring you have a long, successful career. 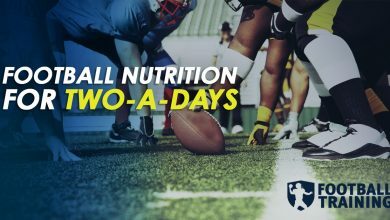 If you call yourself a football athlete and you aren’t focusing on your nutrition yet, it’s time to start getting serious about the game. Everything we do here is to help you become a better football player. 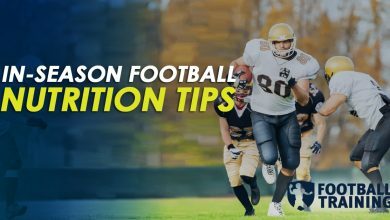 This football training website will provide you with information on how to increase your speed, power, explosiveness, strength, and more - to help you dominate on the football field! © Copyright 2019, All Rights Reserved. Football Training.